The three-year grant will allow her to continue the computational exploration of ferroics, antiferroics and multiferroic materials which is unique because they develop some spontaneous property such as spontaneous polarization, magnetization or strain. DOE originally funded the effort in 2010, which began as an internationally recognized research effort in atomistic predictive modeling of complex ferroics. This grant will help take this project to the next level. The total funding form the DOE for the program is $810,000. 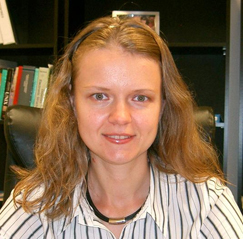 Ponomareva is part of the Computational Nanoscience Research group. This group conducts cutting-edge computational experiments in the area of nanoscience and relies greatly on the high-performance computing.